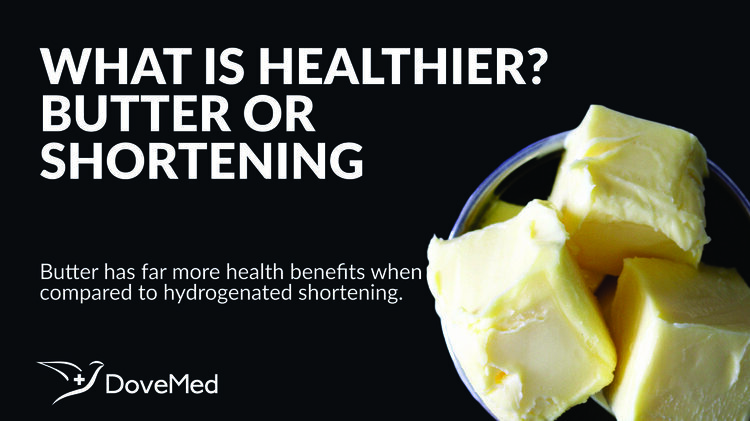 Which Is Healthier: Butter Or Shortening? Butter and shortening are called solid fats because they are solids at room temperature. Solid fats may be made from both animal and plant oils. Butter and shortening are called solid fats because they are solids at room temperature. Solid fats may be made from both animal and plant oils. The plant oils are hydrogenated to form ‘shortening’ that becomes solid at room temperature. These have high content of saturated and trans fat, making it unsuitable for consumption. Therefore, a very minimal level is recommended. Shortening contains trans fat that is harmful for one’s health. It increases LDL cholesterol into the bloodstream, which is harmful; this can create conditions of inflammation resulting in heart attacks, diabetes, and other life-threatening conditions. Research from the Harvard School of Public Health concludes that trans fat is harmful, and even quantities that cause only 2% of calorie intake increase can heighten the risk of heart disease by up to 23%. There are no noted health benefits of shortening and as such, it is unfit for consumption, says an expert panel from the USDA Institute of Medicine. The term shortening is used for the edible substance that can be crumbled. It is an edible fat made from a vegetable or animal base and is used to make baked products soft and short. Some shortening are solids at room temperature and require high melting points. Bakers appreciate the hardness of the shortening. It is used to enhance the eating quality, increase the volume, and also to allow the cake to be fresh for longer periods of time. Shortening is colorless and hence, more suitable for cakes, as it does not change the coloring of the cake. It also has a neutral flavor that does not alter the natural flavor of the cake. The nomads of Central Asia are thought to have discovered butter. Research proves that butter is a healthy food. Dr. Weston Price who studied native diets in 1930s inferred that butter was the staple food for many healthy tribes. Butter contains nutrients and can help protect us from many diseases such as heart disease. Vitamin A in butter aids in the secretion of thyroid and adrenal gland hormones. These two glands play a vital role in improving cardiovascular functions. Infants that suffer from abnormalities of the heart due to vitamin A deficiency can be countered by using butter. Lecithin in butter improves assimilation and metabolism of cholesterol. There are antioxidants present in butter that can protect from free radical damage and weakening of the arteries. It is also a rich source of selenium, an antioxidant. The Medical Research Council has proven that men consuming butter stand a lesser chance of developing heart disease, as against those consuming margarine. Butter has strong anti-cancer properties. It is also rich in short and medium chain fatty acids that can protect from tumor growth. It contains linoleic acid that can help protect the body from cancer. Vitamin A in butter also enhances the immune system. According to Dutch researcher Wulzen, butter protects against joint degenerative arthritis and calcification of the joints. It also defends from cataracts, calcification of the pineal glands, and hardening of the arteries. Vitamin D absorbs calcium and protects from osteoporosis. In conclusion, butter has far more health benefits when compared to hydrogenated shortening. Chang, H. S., & Kinnucan, H. W. (1991). Advertising, information, and product quality: the case of butter. American Journal of Agricultural Economics, 73(4), 1195-1203. Lichtenstein, A. H., Erkkilä, A. T., Lamarche, B., Schwab, U. S., Jalbert, S. M., & Ausman, L. M. (2003). Influence of hydrogenated fat and butter on CVD risk factors: remnant-like particles, glucose and insulin, blood pressure and C-reactive protein. Atherosclerosis, 171(1), 97-107.